The 2014 Lexus IS 350 will introduce a new transmission technology that improves handling by holding the proper gear in high-speed cornering. 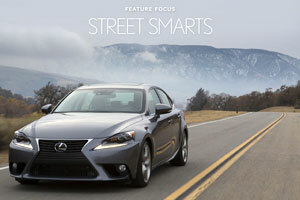 It’s called the G Force Artificial Intelligence system, and Lexus Magazine has all the details. Pontiacmailbox-various: Consumer Reports says the new IS is being built on the GS chassis? True? Are there other similarities?